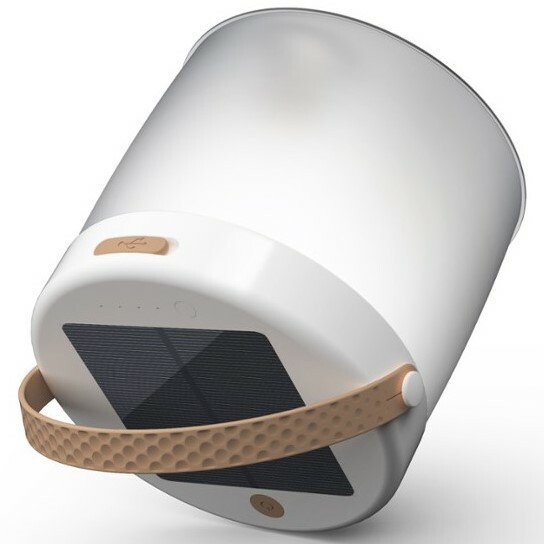 Luci Connect (Retail $64.95) is the new smart solar lantern from MPOWERD. They’ve been making inflatable, solar charged, LED lanterns for a few years now, but this is the first one with a companion app. I’ve really liked their lights in the past, and this new version is no exception. It does everything I’ve come to expect from Luci lights, with some cool new added features. Inside the translucent, inflatable body, which gently diffuses and distributes the light, are 36 adjustable LEDs, 24 white, and 12 RGB, which put out up to 250 lumens of light. 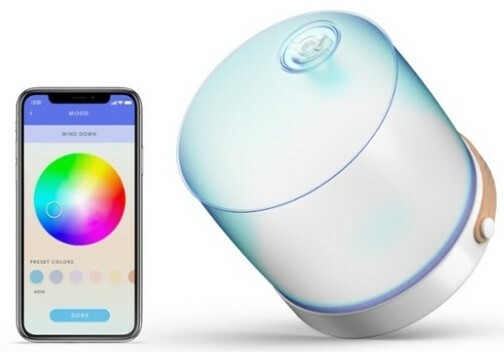 Luci Connect combines these with its mobile app, allowing you to control them from your phone, and giving you hours of colorful, customizable illumination. Luci Connect is 5″ tall, and weighs only 9.2 ounces. The matte-finished, PVC body inflates with ease, and collapses down flat when you let the air out, for compact storage or travel. The hard base, which houses the monocrystalline solar panel, has a removeable silicone handle for hanging. It’s waterproof and even immersible up to a meter. To start charging your Luci Connect, just set it in direct sunlight, solar panel side facing up. It takes 14 hours of sunlight to fully charge the 7.4 Wh lithium-ion battery. If you don’t want to wait, or you’re having a cloudy day, it comes with a USB cable so that you can charge it from a wall plug, in 2-3 hours. 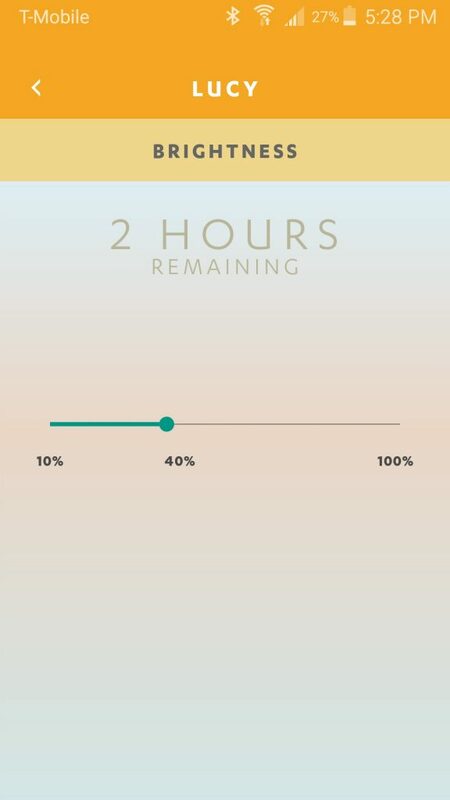 A full charge can give you up to 24 hours of light, when it’s set on the low brightness setting, jumping down to 6 hours on medium, and 2.5 hours on high. The USB port can also output power, so if your phone battery is dying, you can charge it back up from your Luci Connect. This will decrease the number of hours of light it can provide, but sometimes having a charged phone is more important. You can use the button on the base of the device to manually turn the light on and off, and cycle through the 5 preset colors. If you download the free app, which connects to the device via Bluetooth, you can have even more control from your phone. 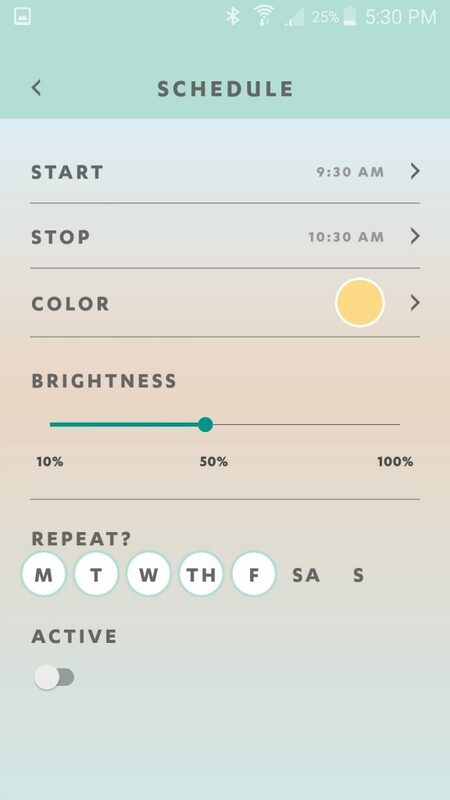 You can turn the light on and off from the main app screen, control the brightness level, see how many minutes of battery life you have left, choose a color for the lights, or choose a “mood.” A mood is a looping sequence of colors for the LEDs to cycle through at a slow, medium, or fast pace. 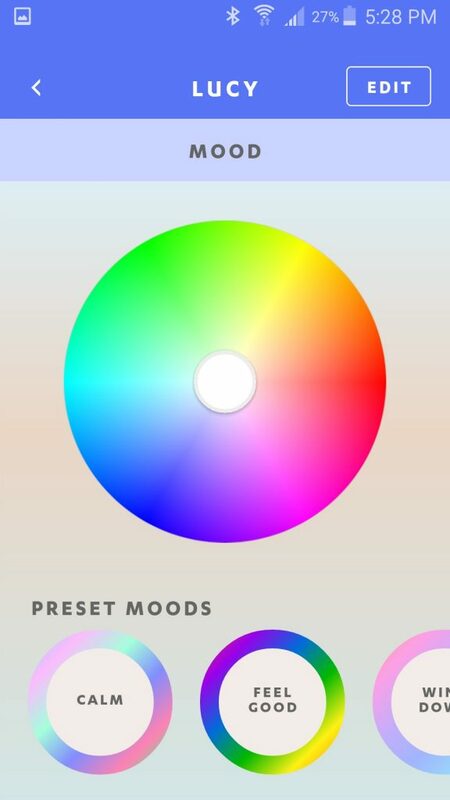 There are a couple preset moods, or you can program a few more of your own, each with up to 6 colors in your pattern. 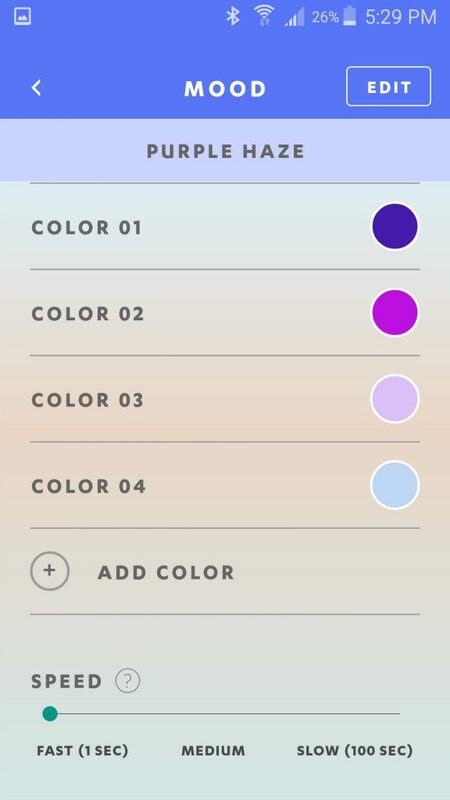 When you choose a color, you can pick from a palette of preset hues, or mix up some custom colors by simply moving your finger around an infinite color wheel. 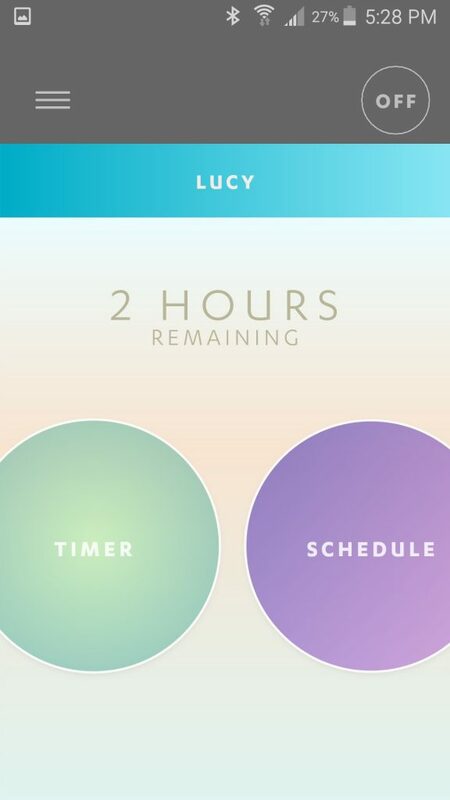 This allows you to truly make the Luci Connect experience your own. 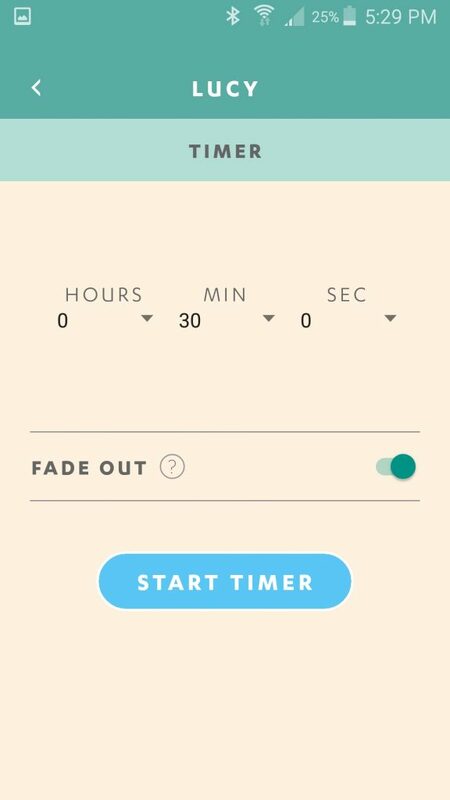 You can also set a timer for the light to turn itself off, or make a full schedule for turning on and off at specific times of the day, and on particular days of the week. If you have more than one Luci Connect, the app let’s you control them all from the same interface. Luci Connect is perfect for camping, evening tailgating, or any other time when you don’t have ready access to the power grid. Personally, I’ve found this, and all of my previous Luci models, ideal for when my power goes out unexpectedly, or a bulb burns out in one room and I don’t have a replacement on hand. For those of us who live in natural disaster-prone areas, this would be a great addition to our earthquake/hurricane/tornado emergency bags, ensuring we will have light and power when we might need it most. Check out the Luci Connect page on MPOWERD‘s site, then take a peak at the app, for iOS or Android.